How long can they deny the obvious? Inside, the opinion wasn’t much better. 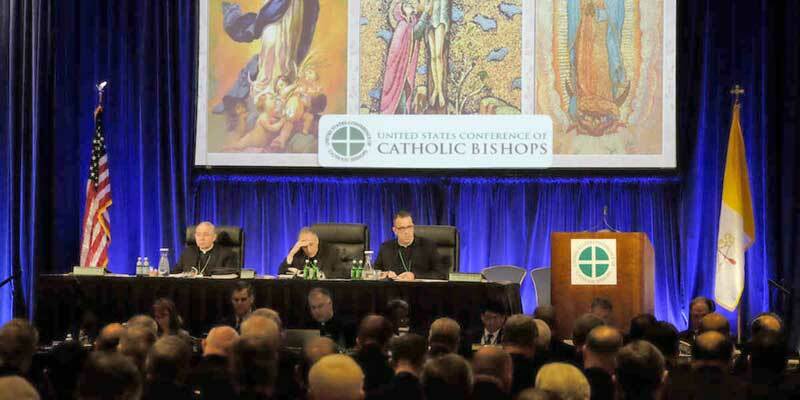 As I sat at the café near the lobby, I overheard an adviser to one of the bishops fume: “There is nothing to show for this conference!” He was furious that even the toothless motion at the end of the conference — which merely asked Pope Francis to release McCarrick-related documents as soon as possible — failed. Cardinal Donald Wuerl, who stands to lose the most in credibility from the release of those documents, had dispatched proxies to kill the motion, such as Bishop George Murry of Ohio. Wuerl served as a puppetmaster at the conference, yanking on this or that string attached to the backs of bishops who owe their elevations to his influence on the Congregation for Bishops. After the conference concluded, I saw Cardinal Daniel DiNardo, the ostensible head of the United States Conference of Catholic Bishops (USCCB), sitting alone on a couch in the lobby waiting for his ride to the airport. I asked him why Wuerl and Cardinal Blasé Cupich, both of whom sit on the Congregation for Bishops, the body which officially ordered DiNardo to block any USCCB votes on the abuse scandal, left him in the dark concerning the Vatican’s intentions. Unconvincingly, he claimed they hadn’t. He said they didn’t learn about it until he informed them of the Vatican’s directive on the eve of the conference. How, then, did Cupich have a statement prepared in mere moments after DiNardo reported the Vatican’s directive to the bishops? DiNardo turned dyspeptic at that question. “I am not giving interviews,” he suddenly said and petulantly mused on my motives.